What had started out as a traditional showcar program has been completely reimagined and renamed to an Experiential Marketing and Merchandising Program. This program has set the new standard for how to maximize value out of sponsorship, and out of an asset that comes along with it. Not only does this program rev-up fans at every market that it visits, it also provides active feedback on stock, traffic, promotions, opportunities and more. 2017 has brought our team to 132 different locations in 34 key markets across the United States. This coast to coast coverage came to 39,700 miles in the striking #22 Shell-Pennzoil truck and trailer, catching eyes through every stretch of highway and city visited. Engaging over 65,750 fans, customers and store managers along the way, the program continues to gather insight designed to help you and your teams drive business growth forward. The digital presence of the program has been expanded in 2017 to provide an improved experience to fans, customers and members of Shell looking to leverage this attractive asset. Take a look at the map below where you can zoom in to each of the 34 markets the program engaged. This interactive map is a great tool for you to get a sense of the diversity of reach captured through the year. You can also easily share or present the map right from this web page, using the tools in the top right. 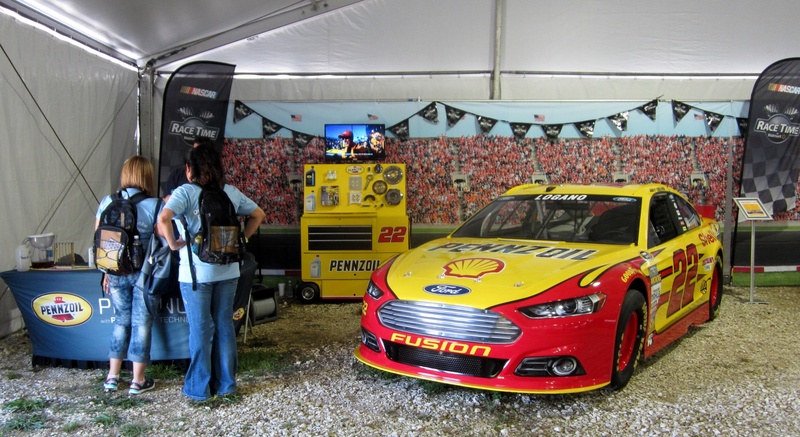 There was an excellent turn out for the two appearances with Joey Logano during the 4th Quarter, especially in Pennzoil markets. Store management was accommodating and happy to have a NASCAR driver in their stores to meet with fans. The Experiential Marketing & Merchandising team, represented by Todd and Kendra Blevins, provides you a weekly report with some key points of detail from each market. For more information on each market and location, please click below to find an index of weekly reports, where you can view and download each PDF file. 🏁 New stores or store re-models are using the Pennzoil branded bottles on the department banner boards in the Automotive/Auto Care Center area. 🏁 During the second quarter, Pennzoil experienced shortages on their synthetic products, due to problems at the refineries. It affected some stores’ ability to provide the roll back for the Pennzoil Platinum oil change specials during that time. By mid-summer, supplies were being replenished and a roll back was offered on Pennzoil Platinum and Pennzoil High Mileage in the fourth quarter. 🏁 Rotella filters were being phased out in stores where they weren't selling well. They were also moved from the middle to the bottom of the filter shelf. 🏁 Quaker State Pit Crew oil change special for $19.99 is the best seller for oil changes, even in Castrol-branded stores. 🏁 Castrol GTX diesel continued their pallet promotion in the second quarter. It did not sell as well as anticipated and managers were forced to find space on the shelf once the promotion was over. Many stores were pricing it at $7.00 on clearance. 🏁 Mobil 1 came out with a new product in March-Annual Protection oil and filters. Stores reported that it was not selling because customers are skeptical of only changing their oil once a year. Recently, Mobil began a new promotion to give customers an incentive to buy the Annual Protection oil. From May 31-Sep 8, 2017, consumers could get a $10 Walmart eGift Card with the purchase of Mobil 1 Annual Protection oil. Mobil is currently still pouring money into this product, with new shelf signage and extending the time to get the $10 Walmart eGift Card until December 31, 2017. It has also been marked down from the original price of $49.98 to $39.98 for 5-quart bottles. One-quart bottles have also been marked down in most stores. 🏁 Valvoline New Easy Pour 5-quart bottles have hit the shelves. 🏁 Castrol Promotion: "The Fate of the Furious" movie ticket promotion (valid date: Mar 1-May 31, 2017). Purchase an oil change service featuring Castrol GTX High Mileage, Castrol GTX MAGNATEC or Castrol EDGE at participating service centers to get movie ticket(s), depending on which service is received. Redeem on line or by mail. 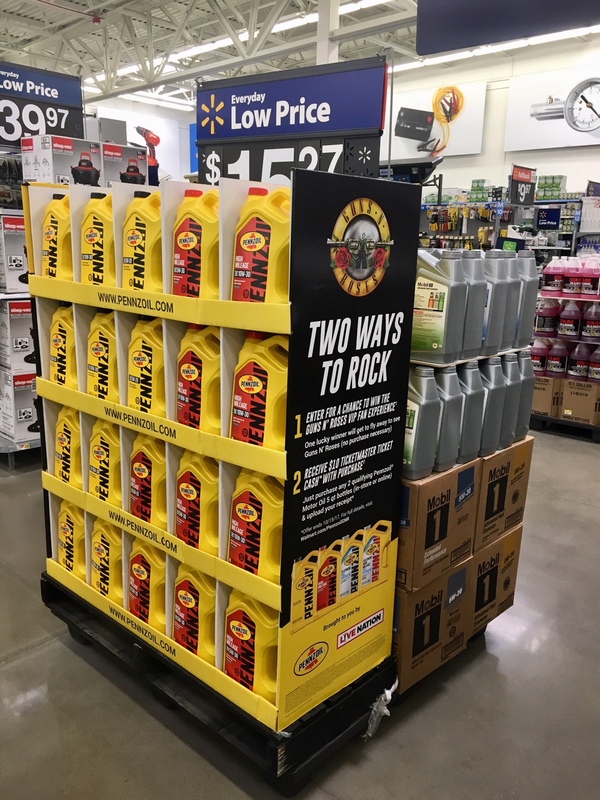 🏁 Pennzoil Promotion: Two Ways to Rock (offer ends October 15, 2017). Enter for a chance to win a Guns N’ Roses VIP fan experience. Receive $10 Ticketmaster ticket cash with purchase. Purchase two qualifying Pennzoil Motor Oil 5-quart bottles (in store or online) and upload receipt. For full details, visit: Walmart.com/PennzoilGNR. 🏁 Valvoline Promotion: $10 Mail in Rebate (valid date: July 1-August 31, 2017). Save $10 on any 5-quart jug of Valvoline Motor Oil. Requests must be received by September 30, 2017. 🏁 Mobil 1 Promotion: $10 Walmart eGift Card with purchase (valid date May 31-September 8, 2017). Purchase 5 quarts or more of Mobil 1 Annual Protection motor oil to receive one $10 Walmart eGift card. Redeem by September 25, 2017. 🏁 Mobil 1 Promotion: $10 Walmart eGift Card with purchase (valid date May 31-December 31, 2017). Purchase 5 quarts or more of Mobil 1 Annual Protection motor oil to receive one $10 Walmart eGift card. Redeem by January 18, 2018. This is the same promotion that originally expired in September. The stickers are the exact same on the 5-quart bottles, with different end dates. 🏁 Castrol Promotion: Free Official NFL Fleece Throw (valid date: September 1, 2017-January 31, 2018). Purchase any oil change service featuring Castrol GTX High Mileage, Castrol GTX MAGNATEC, Castrol Edge, or Castrol Edge High Mileage and receive an NFL team-specific fleece throw by mail. Watch the clip below of Mike Joy mentioning the team on FS1. This is the first year we have built a customized, digital, mobile-friendly site for the Experiential Marketing & Merchandising program. We would love to know what concerns, comments and feedback you have about the platform, and also suggestions for how it can be made more valuable for your business in 2018. Use the current roll back signage from the kit that is sent to each store in the show car set up. Chloroplast boards and banners work best for our outdoor display. New video for the TV on the Marketing Display Tool Cart. QR Codes and/or AR-enabled triggers on tool box so customers can scan and get information on Pennzoil, current promotions, performance display schedule, etc.